Kansas state Sen. Stephanie Clayton was elected as a Republican in Nov., 2018, but has since left and joined the Democrats. Two other former Republicans, Sen. Dinah Sykes and Sen. Barbara Bollier, have done the same. "I thought, 'I really can't do this anymore,' " she says. "By the 12th I was being asked to switch parties" and by the 19th, she had. That was the same day state Sen. Dinah Sykes, another former moderate Republican from the Kansas City suburbs, announced her switch to join the Democrats, too. Sykes, like Clayton, says she felt like an outlier in the Republican caucus. "You know, if you didn't vote in lockstep and fall in line you were penalized." That's what happened to state Sen. Barbara Bollier, also a former moderate Republican from the same Kansas City suburbs. When Bollier endorsed Democratic candidates for election, Kansas Senate President Susan Wagle — a Republican — says she had no choice but to strip Bollier of her committee leadership posts. "That was the line," Wagle says. As a Democrat, Bollier says this legislative session, for the first time, "I don't have that pit in my stomach. That stress of knowing I don't agree with so many of the policies," brought forward by Republicans. Like the other former-Republican lawmakers, Bollier says she reached a breaking point, too. She didn't align with Republican positions on issues ranging from LGBTQ rights to Medicaid expansion and says she gave up trying to steer the party back to what she considered its traditional center. "I've spent nine years trying to do that and I failed, and I'm not alone. Many people have been trying to do that," Bollier says. On the surface, Kansas House Majority Leader Daniel Hawkins seems unconcerned by the defections. "Was she ever really voting with us as a Republican?" he says of Stephanie Clayton. "I think if you look at her voting record, she's where she should be." "It's a trend that we'd been seen in suburbia growing for 20 years," says University of Kansas political scientist Patrick Miller about the transition from red to blue in the Kansas City suburbs. "I think it's reached a flashpoint recently." And by switching parties, these lawmakers have likely improved their re-election chances, Miller says. Going from majority party outcasts to celebrated members of the minority could also increase their influence as lawmakers. Bollier – a retired physician – is now the ranking Democrat on the health committee. A slot that, until recently, was filled by former state senator, now Governor, Laura Kelly. As lawmakers return to the Kansas State Capitol this year, three seats won by Republicans are now in the hands of Democrats. That's after three suburban Republican women switched parties, saying they no longer felt at home in the GOP. Jim McLean of the Kansas News Service brings us the story. 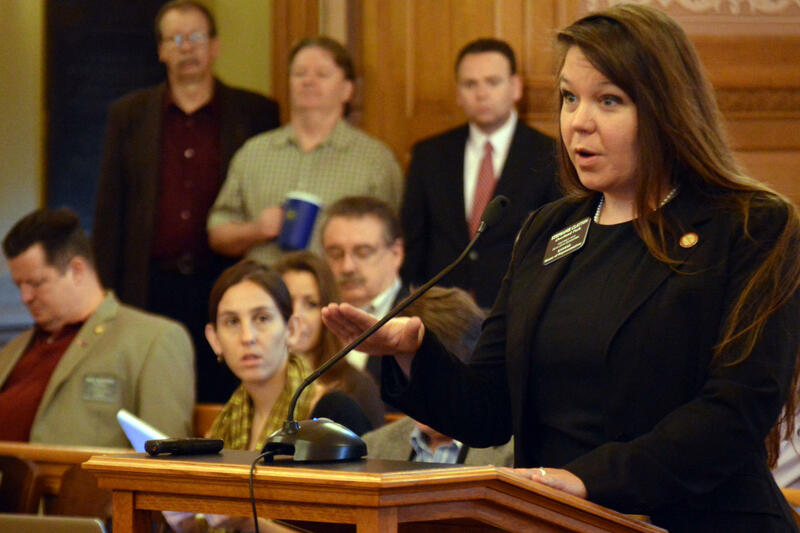 JIM MCLEAN, BYLINE: Stephanie Clayton started her fourth term in the Kansas House as a Democrat. She won re-election as a moderate Republican but had an abrupt change of heart about a month later. STEPHANIE CLAYTON: It was Monday, December 10. MCLEAN: That was the day Republican legislative leaders said they wanted to rewrite a school finance bill that Clayton and other moderate Republicans had fought side by side with Democrats to pass the previous session. It was a breaking point. CLAYTON: I thought, I really can't do this anymore. I don't know what to do. And by the 19th, I had made my announcement. MCLEAN: Clayton announced her switch the same day as state Senator Dinah Sykes, another former moderate Republican from the Kansas City suburbs. Sykes, like Clayton, says she felt like an outsider in the Republican caucus. DINAH SYKES: You know, if you didn't vote lockstep and fall in line, you were penalized. MCLEAN: That's what happened to state Senator Barbara Bollier, another former moderate Republican from the same Kansas City suburbs. Kansas Senate President Susan Wagle, a Republican, says she had no choice but to strip Bollier of her committee leadership posts for endorsing Democrats. SUSAN WAGLE: And that was the line. She endorsed against an incumbent Republican congressman in her district. And she also endorsed that day the Democrat for governor. MCLEAN: As a Democrat, Bollier says she's approaching this year's legislative session with new enthusiasm. BARBARA BOLLIER: For the first time ever, I don't have that pit in my stomach, that stress of knowing I don't agree with so many of the policies they're trying to bring forward. MCLEAN: Like the others, Bollier reached a breaking point. Republican positions on issues ranging from LGBTQ rights to Medicaid expansion didn't align with hers. And she gave up trying to steer the party back to what she considered its traditional center. BOLLIER: And I've spent nine years trying to do that, and I failed. And I'm not alone. Many people have been trying to do that, all my moderate Republican colleagues. MCLEAN: The transition from red to blue in the Kansas City suburbs mirrors what's happening across the country, says University of Kansas political scientist Patrick Miller. PATRICK MILLER: It's a trend that's - we've been seeing in suburbia growing for 20 years. And I think it's reached a flash point recently where it's very obvious on maps. MCLEAN: Miller grew up in Virginia. And he says today's transformation is the reverse of what he saw happening in the South a generation ago when conservative Democrats morphed into Republicans. MILLER: And I see this as very much the same phenomenon of people who, 20 or 30 years ago, could have been very comfortable in a Republican Party that was a lot more diverse ideologically but who, in a politics of 2018, they're going to be more comfortable and fit better with where the Democratic Party is today. MCLEAN: The lawmakers have likely improved their re-election chances by switching parties, Miller says. And going from majority party outcasts to celebrated members of the minority could also increase their influence as lawmakers. Bollier, a retired physician, is now the ranking Democrat on the Health Committee, a slot that until recently was filled by former state senator, now-Governor Laura Kelly. On the surface, Kansas House majority leader Dan Hawkins seems unconcerned by the defections. Here he is reacting to Clayton's. DAN HAWKINS: Was she ever really voting with us as a Republican? I think if you look at her voting record, she's where she should be. MCLEAN: But privately, the question nagging Hawkins and other top Republicans is this. Are these three parties switchers the exception, or are they the start of a trend that could make Democrats more competitive in a state that Republicans have reflexively put in the win column? For NPR News, I'm Jim McLean in Topeka. (SOUNDBITE OF M. WARD'S "DUET FOR GUITARS NO. 2") Transcript provided by NPR, Copyright NPR.